Having seen The Force Awakens, I really want to watch all 6 of the other Star Wars movies again. 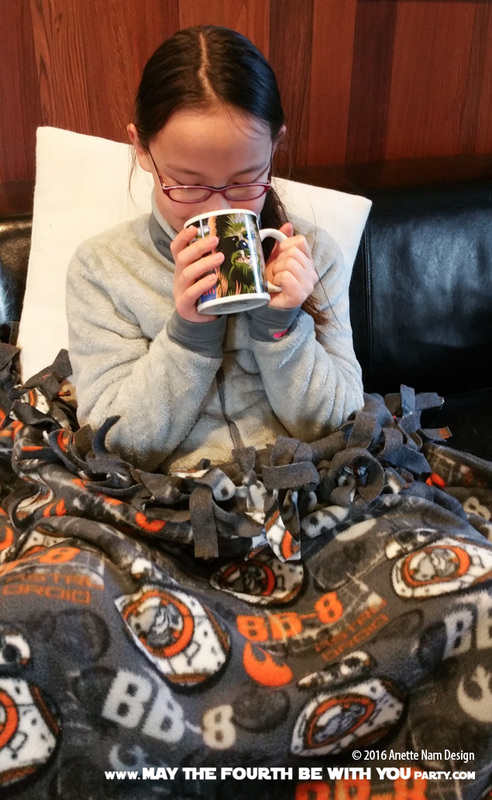 What better way, than curled up on the couch with a cozy BB-8 fleece blanket, and a cup of Hoth Chocolate in a Chewbacca mug… and possibly a plate of Imperial Star Destroyer crackers. Among the numerous Star Wars themed presents under our tree this year, #1 got two large fleece pieces for Christmas. 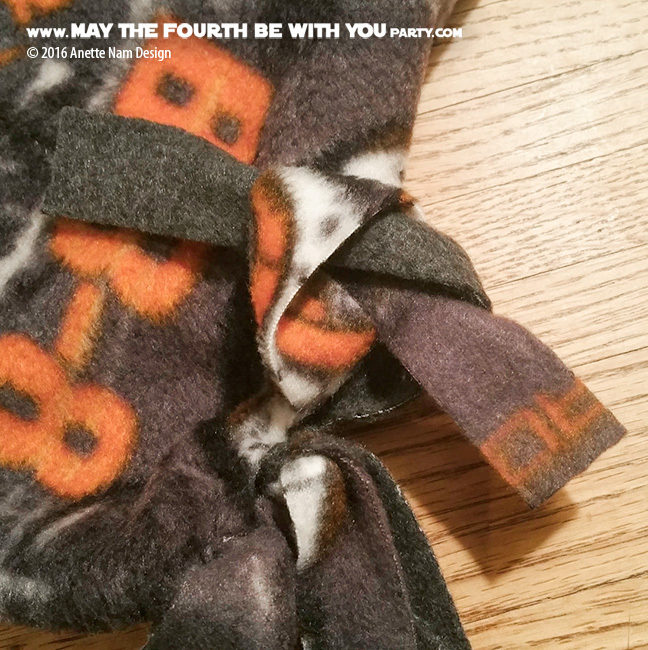 She adores BB-8, and fell in love with this fabric on a recent trip to JoAnn’s Fabric. Santa was kind enough to give it to her, and she and I spent part of Christmas break making her a really snuggly BB-8 (almost) no-sew fleece blanket. It only took us about 3 hours to make – a perfect project for a Saturday afternoon. It was done just in time for movie night, and we all ended up fighting over who got to use it. As you can see from the photo above, she won! We might have to make more…. 2 pieces of Fleece (ours were 72″ x 54″). 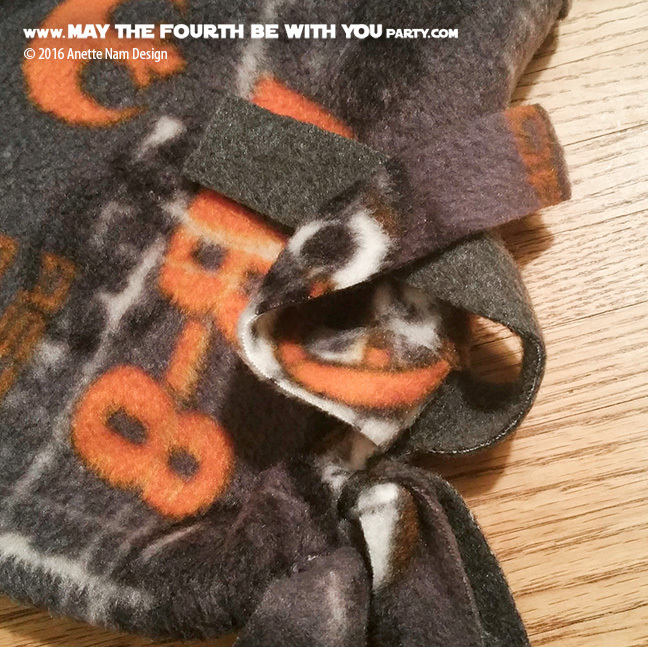 We got them from JoAnn Fabric in Dec. 2015, but the BB-8 is not available online. Check your local store, they might still have it. Character fleece usually has 1” of © info on one edge, and regular fleece has a 0.5” of smooth fabric on both edges – cut all that off. Cut the 2 fleece pieces to the same size. Pin the long sides together. Cut the unsewn (short) edges to even out, if needed. Measure 5.5” from the edge on one of the unsewn (short) sides. Using clear ruler as both guide and straight edge, and rotary cutter, cut 1”w (and 5.5” long) strips through both pieces of fleece. Remove tape, repeat the taping and cutting on the other unsewn (short) edge. 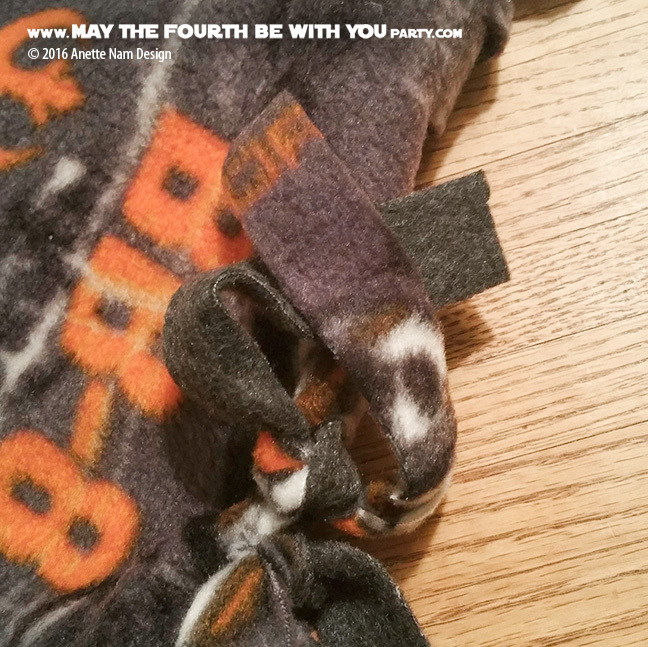 Using 1 strip from each piece fleece, make knots all along both edges. Fold over grey strip (from right, to left). Fold BB-8 strip on top (from left, to right). 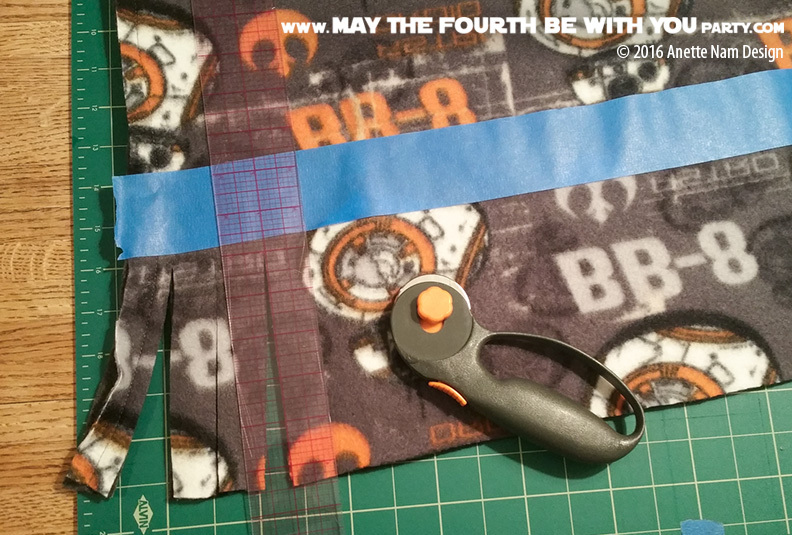 Then pull the BB-8 strip under and through the grey strip loop. Pull tight. Fold over grey strip (from left, to right). 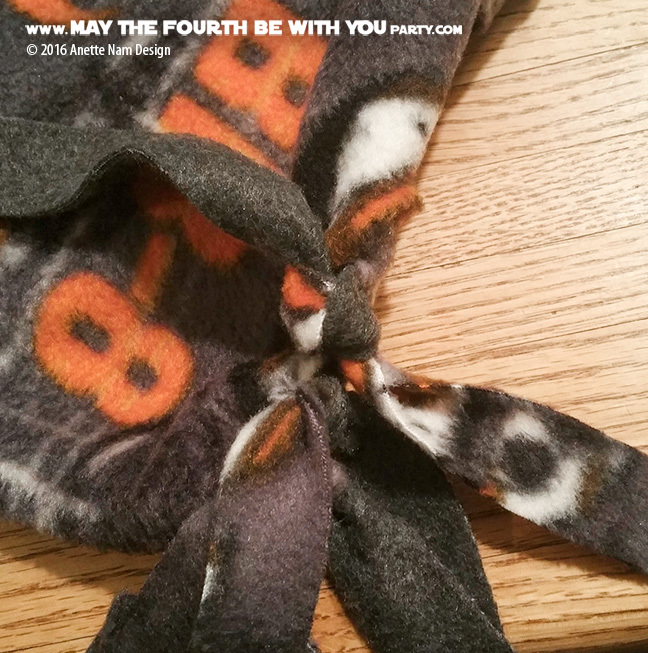 Fold BB-8 strip on top (from right, to left). Then pull the BB-8 strip under and through the grey strip loop. Pull tight. The first and last strips are made up of both fabrics sewn together. We made a simple, single overhand knot there. 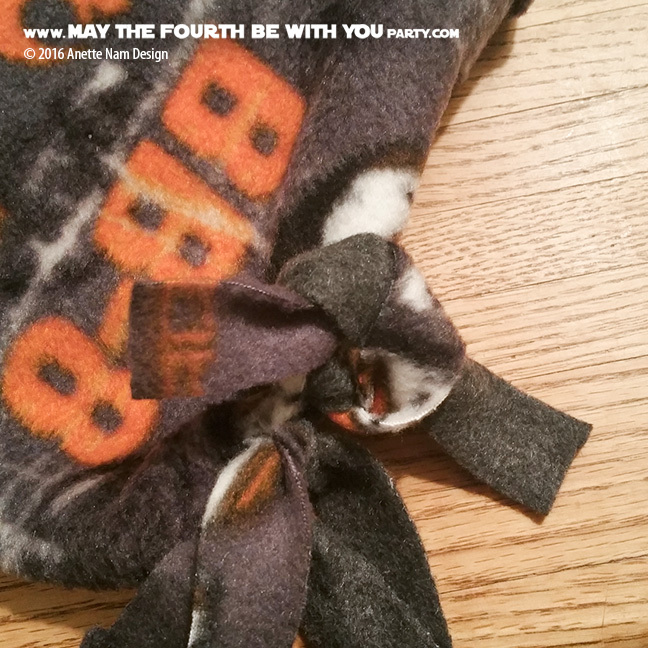 You can tie the whole blanket, if you want to make it a traditional no-sew fleece blanket. We didn’t want fringes on all sides, so we sewed the long sides. The hardest part is to make sure that the fringes get aligned right. My daughter did all the tying, and missed one strip on one side, and ended up with 1 extra strip at the end. She had to redo almost a whole side – and was not happy about it. 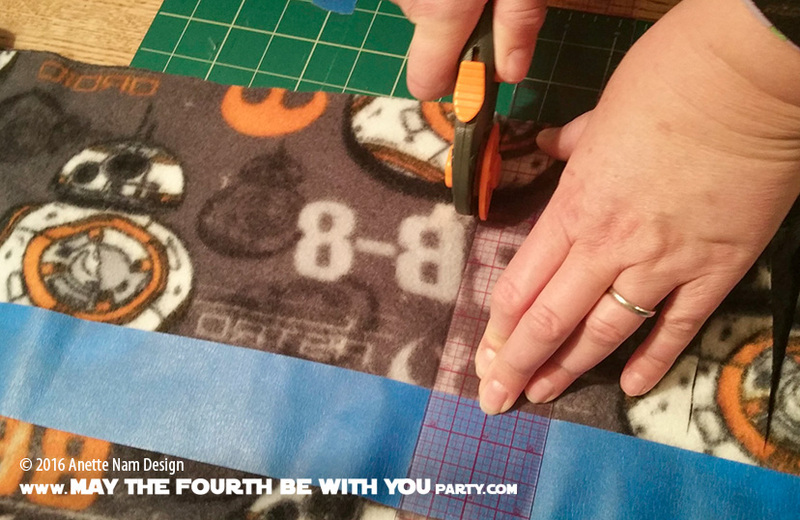 The fringes would be easier to align, if you turn the blanket right-side-out BEFORE you cut – the static would keep them together after cutting. But cutting would be harder. The Chewbacca mug was a gift a few years back (2012 maybe), and does not seem to be available any more. You can find lots of other Star Wars Mugs on Amazon. The R2-D2 PJs were bought at Target in October 2015, and I have not seem them online or at the store since. Again, Amazon has other Star Wars Pajamas .